Continued... It was Christmas eve in the San Diego area, another fine day of pleasant weather in the Southland. I had dutifully stood in line in the early morning hour to pick up the traditional ham at Honeybaked in Escondido before heading off with my daughter to tag some easy peaks around San Marcos and Carlsbad. This summit is the highpoint of the Rancho La Costa Habitat Conservation Area, a small island amidst the expansive suburban sprawl. The distance from our starting point (the junction of Corte Romero & Camino Junipero) to the summit was barely half a mile, but it would take us more than three times that distance to reach the summit thanks to the Switchback Trail we followed, possibly the worst set of trail switchbacks I've ever come across. They were long and meandering, without a steady grade of any sort and seemed designed by someone with no trail-building skills whatsoever. The terrain is mostly open chaparral, not heavily vegetated. The trail has many shortcuts that have developed over the years to no great surprise. Open to both cyclists and hikers, the trail may be more suited for mountain bike travel, but I suspect they aren't too thrilled with it either. We spent about 45min climbing to the open summit. Having left our water in the car ("don't worry, it's an easy hike") we were regretting that decision by the time we topped out. There are several benches to rest on next to an information plaque, along with a shade trellis that had been constructed as someone's Eagle Scout project. It was one of several such projects we came across in the park. The summit offers nice, open views is all directions and appears to be fairly popular. There are other trails that can be found leading off in other directions. We used one of these to make shorter work of our return. This lowly summit is found in an industial part of Carlsbad. It's southern flanks had been cleared for new development that went bust back in 2008. Realtor signs remain hopeful but so far only the centermost site has been built upon. We parked at the highest point along Whiptail Loop and made the 5min hike to the summit. The route I picked was far from optimal, involving some light bushwhacking along a drainage culvert. The summit itself was a mess of higher brush with little of interest. Jackie was a good sport, however, and laughed off the ridiculousness of it all. We found an easier trail for the return. This companion summit to Mt. Marron is found to the northwest across Agua Hedionda Creek. We drove around to a suburban development on the north side, a few minutes from the top. We had to surmount a formidable fence in order to get into what appears to be preserve of some kind around Los Monos Canyon, protecting the creek and the habitats it contains. There were trail signs found at a junction, old and fading, indicating the area was open, or planned to be opened, to public use at one time. It does not appear to get many visitors and the trails do not seem to be maintained. We followed the signs indicating "Mt. Hinton" to the uninteresting summit a short distance to the southwest. A liter-sized empty bottle of vodka attested to the summit's occassional draw for adolescents. These two summits are found north of Mt. Hinton. The former has been completely developed over and the highpoint is impossible to pinpoint once the bulldozers did their work. It appears to be in someone's yard along Shadowridge Dr. A water tower sits atop San Francisco Peak off Nighthawk Way. The fence surrounding it is even more formidable than the one we previously scaled and Jackie had no interest in this one. I decided not to add to her concern and we left it undisturbed. Having had enough, Jackie decided not to join me on this last summit, which I found to be the best of the bunch. We parked at the end of Cannon Rd where there are ample signs indicating No Parking. There are shorter and more legal ways to reach this summit, but I had picked this as the easiest driving from the previous point. 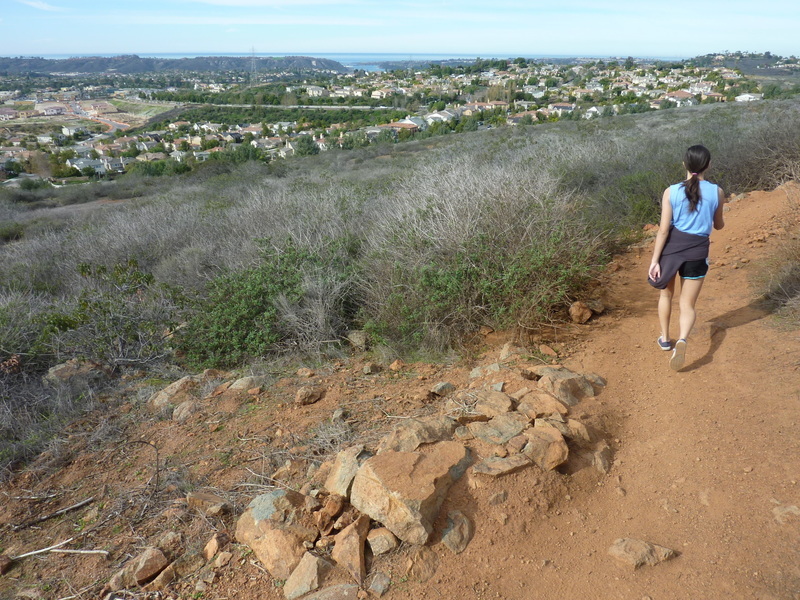 The summit and surrounding areas are part of a patchwork of open space areas around Calavera Lake in Carlsbad. It is popular for hiking and biking and there were many people out during the short time I was there. From where I parked there is a trail heading north along the fence with the New Venture Christian Fellowship, eventually turning west with several forks heading towards the small standalone summit across grassy hillocks. Use trails lead to the summit from at least three sides of the hill. I went up the east side starting near a trailside kiosk, found several parties taking in the views from the summit, and descended the south side before returning across the grassy fields to the original trail I'd started on. In all I spent 45min for the round trip. My parents live in a house on the top of the well populated, but barely discernible summit just to the right of where Batiquitos Lagoon can be seen in the center distance. You mean I could have been out here hiking up this instead of spending our holiday visits sitting around the house hearing over and over again about, 'what I could have been if only I hadn't wasted so much time climbing and hiking'?